How many addresses can I add to a map? How do I add more than 250 items to a map? Signup for the pro version of EasyMapMaker to map up to 1,500 locations, the premium version supports up to 15,000 locations, and the premium bulk data version supports up to 100K locations but requires the data to have latitude and longitude coordinates. Why is your service no longer entirely free. We have to pay google a lot to use their business license. Previously we used their free api but we commonly got hit with fees. Google's maps for business license allows us to offer high resolution images. Can I replace the EasyMapMaker logo on my map? Yes, Premium users can replace or hide the logo. Another way to add a custom logo is to use advanced map options and upload a logo in the Customization section. The default image size is 45x45 pixels and the replacement should ideally be the same. Can I change the font or add custom styling to my map? The url must start with either https:// (preferred) or http:// and the url must exist to be included. How can I update or delete an existing map? EasyMapMaker Subscribers can go to the My Maps menu to view all their maps. No, we will not do anything custom. We will add features based on requests. There are a lot of features we plan to add, but there have not been any requests for them. Feel free to request features on our contact page. How can I view my data on google maps? If you generated the kml, you can import it onto a google map (hosted by google). Google has a limit of 2,000 items on the map. If you have more than 2,000 locations, you will need to break up the kml yourself or create a map with 2,000 or fewer locations. There is a problem with _fill_in_the_blank feature (There is a bug). Please let us know via our contact page if something does not work. Sometimes google will make a change and break something; sometimes we make a change and break something, and other times something just does not work as it is supposed to. Is there a way to hide the list of data below the map? Yes, you can turn off the data on the bottom of the page. If you go to the edit page (should be in an email sent after saving the map), there is a 'Map Layout' section. You have the option to turn off the data showing below the page. Can I make a map without an address? Yes. If you have a latitude and longitude location, those can be mapped quickly. If you only have part of an address, such as a zipcode, or city, state then those can be mapped as well. Can I pull coordinates from a database to create a dynamic map? No. At this time our solution does not support pulling data from a database. Do your maps work on mobile devices and tablets? Yes. Most Apple and Android mobile and tablet devices are supported. However, some features are not fully supported on all devices. Mobile/tablet maps are also able to use location services when enabled. Building and editing maps can be done on mobile and tablet devices, but it is not recommended and not supported. How can I assign different colors to different items in my data set so they can be identified on the map.? 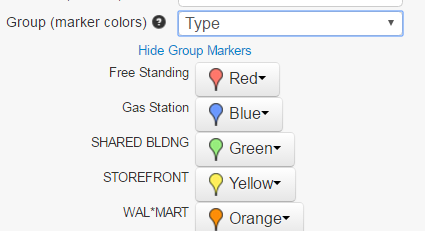 The colors are automatically assigned based on the column you set as the group. There are up to 7 (20 for subscriber maps) different colors that are used. If a column has more than 7 (20 for subscriber maps) different unique values, they will be grouped together in ranges. It's best to define the range yourself and use that for the group (if you have more than 7 unique values in a column). After assigning a group the colors can be changed as shown in the above image. How can I get pie charts my map? Pie charts are automatically enabled when you turn on clustering and set a group from your map (see the above question for groups). Maps will be remain active unless they have not been modified or viewed in the past 90 days. They can be deleted anytime before this by the person who made the map. Maps will remain active unless they are deleted by the user or the subscription stops. How can I print my map, save it as an image or a pdf file? Login, view the map and select export map from the menu. A window will popup allowing you to select the options for saving the map. These include poster size images ( Premium only 10800 x 7200) and the visible map window. The image/pdf will use the current zoom level of the map. For images larger than the visible map dimensions, the areas bordering the visible area are used. For high resolution poster sized images, it's a good idea to zoom in. High resolution means the image will be 4 times larger than what is visible in the browser. To save your map as a pdf file, use google chrome or safari to print the map and save it as a pdf file instead of printing it. You can save your map as an image by taking a screen shot of your map (alt + print screen normally works; or try ctrl + print screen). Once you have a screen shot, you should be able to paste it into an image editing tool such as paint.net. The size of the map can be as large as your web browser window if you don't embed it. How can I get copyright permission to print a map? You can print the maps under the fair use copyright as long as you include the attribution (in the lower right) and as long as it will not be used in Guidebooks, Consumer Goods (mugs, shirts), or Print advertisement. For specifics on attribution see google's attribution page. For more specifics on printing see google's usage in print section. Some of my addresses get mapped to the wrong location or do not get mapped at all, can you fix this? We use Google's geo-coder to translate an address into a latitude and longitude set of coordinates to be placed on the map. Sometimes an address is not found and other times it can be placed where it should not be. The geo-coder appears to work very well in most industrialized countries such as the United States. If a location cannot be mapped, sometimes modifying the address slightly will get the address to work. If you only have a zip-code adding a country and state could improving the mapping if it gets placed in the wrong country. You can manually type in an address to see where Google's geo-coder will place an address . Be aware that google's geo-coder is not the same as typing something in on Google Maps. Google maps most likely uses google's vast search capabilities to find out where a restaurant, store, address, and other places should be placed on the map. How can I see the lines or addresses that were not processed (geo-coded) successfully? On the Edit page, the original data can be re-inserted and re-mapped. The data that had errors will get reprocessed and the successful data will use the information that was already processed. The locations with errors can be seen using the error table (shown above). Can I export or extract the latitude and longitude coordinates? What latitude and longitude formats are supported? Data can be mapped in EasyMapMaker with only the latitude and longitude. To set the latitude and longitude, make sure the Latitude and Longitude drop downs are set correctly. The values need to appear in separate columns. N 45 46' 52" W 108 30' 14"
N45 46' 52" W108 30' 14"
How does the search box in the upper right hand corner work? It can be used as a filter. The search works by as a whole field substring search. If you have 'John Smith' and 'Jane Smith' in the dataset and search for 'Smith' it will give both of the above 2 items as options. When you click one (say 'John Smith'), it will show all results with a field that matches 'John Smith'. It can be used to find a location. If you type in 'Smith' (from the example above) and hit enter, it will look for 'Smith' as a location since one of the filter options was not selected. In this case Google's geo-coder will be used, and in some cases (such as searching for 'Smith') the resulting location is not as obvious as searching for 'New York, NY'.